Figure 1. 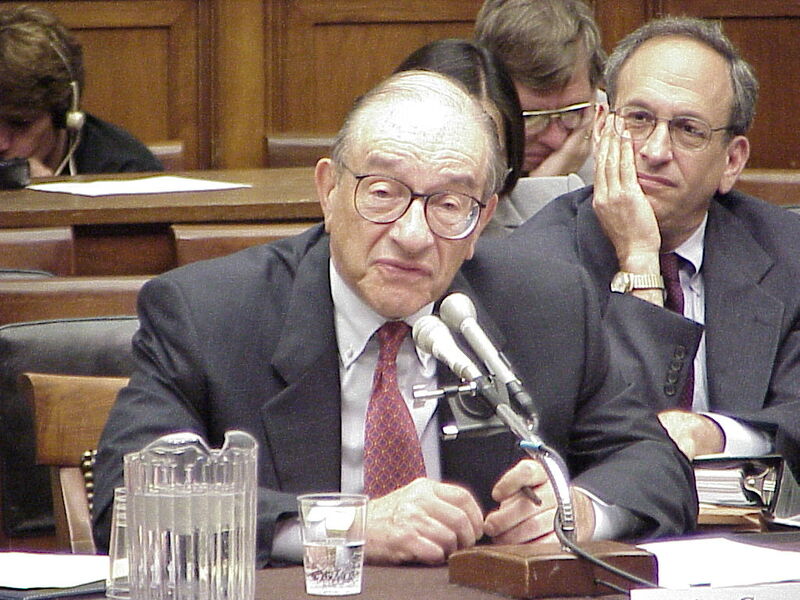 Alan Greenspan, neoclassical economists and Chairman of the Federal Reserve from 1987 to 2006. Much of the previous discussion in this module has taken a Keynesian policy-activist perspective. Recall that the classical, hands-off, approach was initially recommended when the economy collapsed during the Great Depression, but then Keynes came along and recommended that the government step in and intervene in order to make up for a shortfall in private sector spending. One criticism of the Keynesian approach is that the government needs to deficit spend in order to stimulate the economy. Deficit spending requires the government to borrow money, which may lead to higher interest rates, making it harder for private businesses to borrow money. This is known as crowding out, and weakens the effects of fiscal policy. Keynesians would argue that any crowding out is minimal, since the economy is not operating at full capacity; thus resources can be found easily without taking them away from private businesses. Neoclassicals believe in a more passive fiscal policy approach, designed to promote economic growth with stable prices. They believe in low tax rates and limited government spending, which they believe will allow the private sector, and thus the economy as a whole, to flourish. Alan Greenspan, former chair of the Board of Governors of the Federal Reserve is one such neoclassical economist. Many neoclassicals, including Greenspan, are wary of budget deficits, arguing that they provide a drag on economic growth because of crowding out. Watch this video to understand how some neoclassically-minded small business owners and economists felt about the possibility of ending the Bush tax cuts in 2010. Note that these tax cuts were eventually extended, although changes were made later in the American Taxpayer Relief Act of 2012. A particular type of Neoclassical economics became popular in the 1980s, after the election of President Ronald Reagan. This was supply-side economics, also known as Reaganomics. Supply-siders believe that economic activity is motivated by after-tax returns to that activity. Thus, people are attracted to jobs that pay well, and businesses are attracted to industries with high profits. Additionally, tax cuts increase economic activity. Business investment, which is determined by the after-tax rate of return to capital investment. The implication is that tax cuts on personal income cause an increase in the supply of labor as individuals increase their work effort and work hours. Tax cuts on saving cause people to save more. For this reason, supply-siders favor reductions in capital gains tax rates. Tax cuts on corporate profits cause an increase business investment. Increased labor supply, saving and investment lead to more aggregate supply and enhanced economic growth. Some supply siders favor a flat tax, which we introduced earlier in the section on taxation. A flat tax is proportional, meaning that all individuals or corporations would pay the same tax rate. A genuinely proportional tax should, theoretically, enhance economic efficiency, but it would make the tax system less progressive. 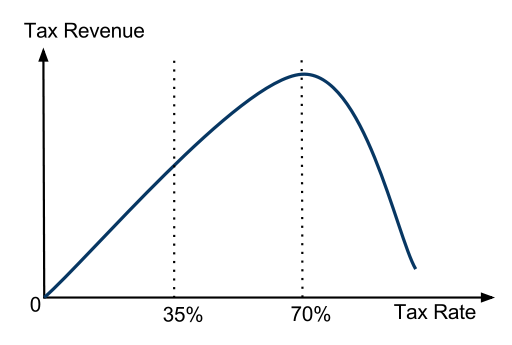 This illustrates the frequent trade-off between efficiency and equity in economics. Some analysts see a flat tax as a Trojan horse designed to reduce tax rates and tax revenues in general. For this reason, tax reforms are often designed to be neutral, meaning that they keep the average tax rates and the tax revenue generated unchanged. Figure 2. The Laffer Curve. As tax rates increase, tax revenues (i.e. what the government receives) increase at first, but then decrease once rates get “too high” as people reduce their work effort or hide their income. The figure indicates that the tax rate which maximizes tax revenue is 70%, but this is just an illustration of the concept. Supply-siders don’t worry much about budget deficits. They believe that tax cuts will stimulate the economy and bring in additional tax revenues so that that tax cuts lead to more revenues and thus lower budget deficits. This is the idea behind the Laffer Curve, which shows the relationship between tax rates and tax revenues, i.e. T = t*Y, where T is tax revenues, t is the tax rate, and Y is income (or the tax base). At low tax rates, higher tax rates cause higher tax revenues. At some point, though, tax rates get so high that people start to work less, or hide their income, so that higher rates lead to lower tax revenues. If tax rates are sufficiently high then, reducing them will raise income and raise tax revenues so that budget deficits fall. The Laffer Curve is somewhat controversial in practice. Most economists don’t believe that the U.S. is on the downward sloping part of the curve. Supply-siders argue then that even if budget deficits don’t fall in response to tax cuts, the economic growth generated will bring in enough additional tax revenues to make them sustainable. Watch this video for a review of fiscal policy and to learn in more detail about the varying debates about when and how government should intervene in the economy. First, you’ll review the Keynesian and neoclassical approaches to fiscal policy, then take a look at how different approaches were used to deal with the Great Recession, which was a global phenomenon. Great Britain and other Western European nations took a neoclassical approach and implemented austerity programs (raising taxes and cutting government spending to reduce budget deficits and public debt). The U.S. took a more Keynesian approach with the American Recovery and Reinvestment Act of 2009 (ARRA), which combined tax cuts and government spending increases. As a result, the U.S. economy recovered from the Great Recession more quickly than did the European economies. Another thing to consider when analyzing fiscal policy is the spending multiplier effect, which we introduced in an earlier module. When government increases spending, the money can ripple through the economy and have a more than proportionate impact on GDP. If the economy is already booming and resources are full employed, then the multiplier tends to stay around 1, thus an increase in government spending doesn’t have a large impact. During a recession, though, the multiplier may be closer to 2 and have a much larger effect. .